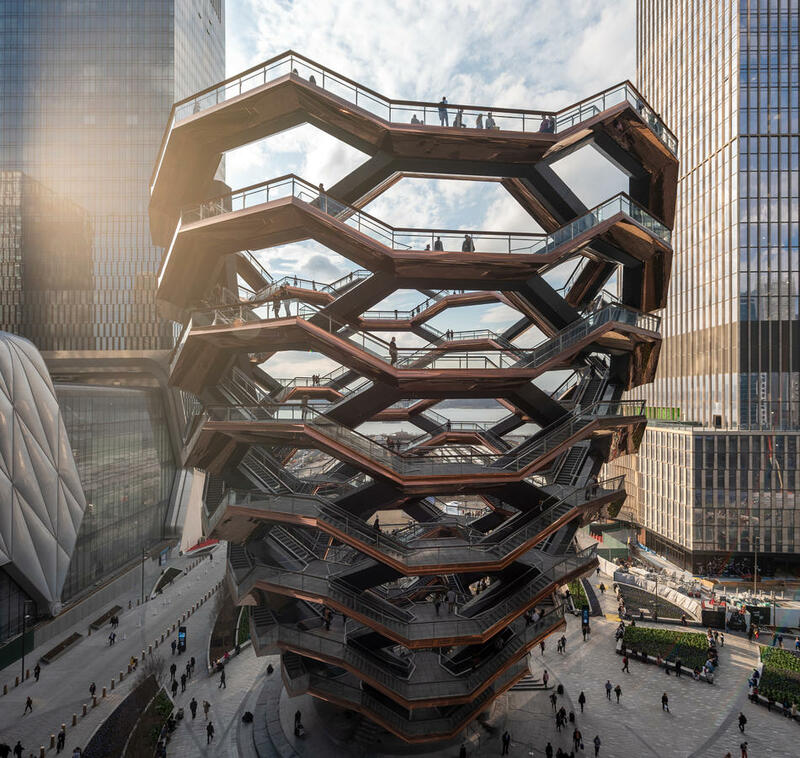 People really hate Thomas Heatherwick’s new Escher-esque “Vessel,” a climbable sculpture in New York City’s billionaire playground of Hudson Yards, and they’re not afraid to wax poetic about it. 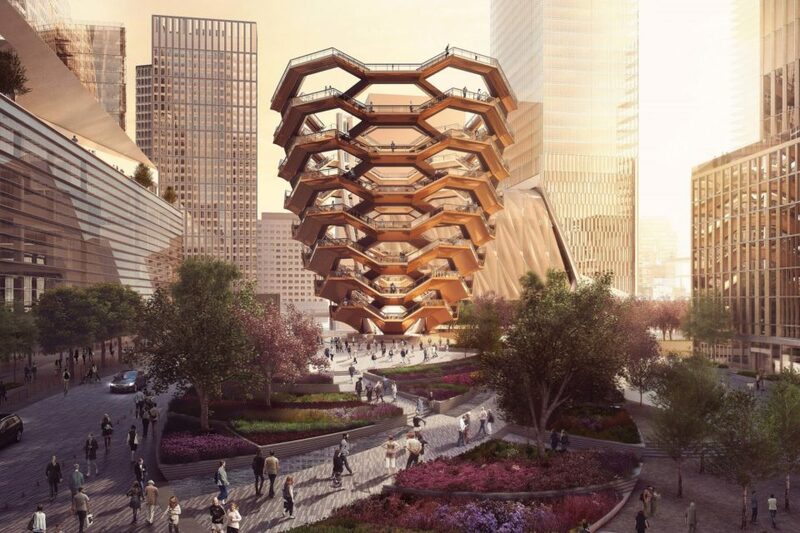 It’s a stairway to nowhere; a giant shawarma; a pine cone; a beehive; a trash basket; the rib cage of a monstrous robot. Its name is fitting, some argue, as it’s little more than an empty monument to the outrageous excess with which it’s surrounded. According to Heatherwick, “Vessel” was always meant to be a placeholder name until the public experiences it and helps give it a new one. But with questions of its ultimate accessibility, usefulness and symbolic meaning to the public driving much of this criticism, perhaps the British designer won’t be pleased with the results. I went to the new 25 Billion dollar #HudsonYards complex, on the very far West Side of Manhatran yesterday. Essentially it is a suburban mall without parking. Very crowded, but seemingly few shoppers. Wonder what will happen when the novelty wears off. More than 1,000 people crowded around the vase of the imposing structure on March 15th, 2019, as it was commemorated and opened to the public. 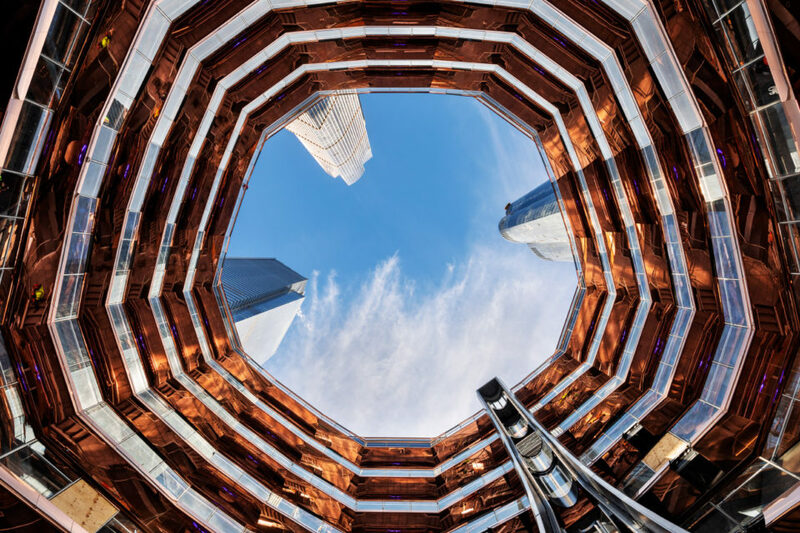 Comprised of 154 interconnecting flights of stairs, including nearly 2,500 individual steps and 80 landings, “Vessel” gives visitors a view of a long-anticipated $25 billion mixed-use complex full of condos that cost between $4 million and $32 million (or more) as well as super-tall office towers, a luxury shopping zone and high-end restaurants. Opening day was chaotic, with crowds pushing up and down every segment of stairway with their selfie sticks waving in the air, leaving few places to rest momentarily before pushing on. 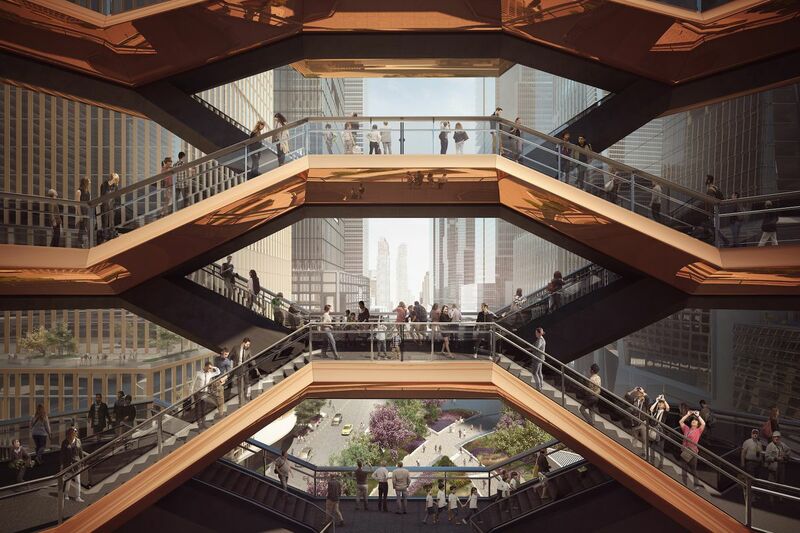 Hudson Yard’s billionaire developers, led by Stephen Ross, have framed the Vessel as a benefit to New Yorkers and tourists alike, calling it a public amenity. 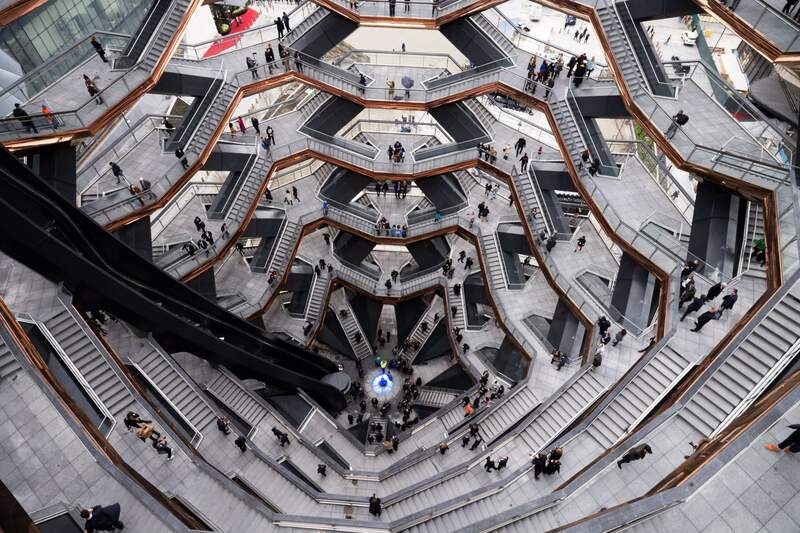 “We think of this as a three-dimensional public space, like a park, but taller,” says Heatherwick lead designer Stuart Wood. Ross himself notes that Hudson Yards can’t be a playground for billionaires, as it’s been deemed in public discourse, because it has an H&M and a Shake Shack. 3. 2060 Underwater Amusement Park. The story of Hudson Yards is one that has played out on a smaller scale time and time again in New York City and virtually every other city in the world: a story of a piece of land that was devalued by the pollution of industry, marked for redevelopment via lucrative tax breaks and then transformed into something the vast majority of local residents can’t use. Developers and city officials have long seen the “Far West Side,” which used to be little more than an open pit full of trains, as a blank canvas, with Hudson Yards only emerging as the victor after the death of a dream to host the Olympics in this spot. The platform upon which it’s built is certainly a feat of engineering, and advocates note that the project will add 4,000 new apartments, a school, parkland and as many as 55,000 jobs to the city. The completed portion is only the eastern half; the rest will be under construction through 2024. In editorial after editorial and thousands of tweets, New Yorkers have expressed their dismay at the fact that this gargantuan project feels so alienating, so wasteful, so clearly not for them. Just as with every condo that goes up in a formerly vacant lot or on the site of a demolished house or business, the investment capital required to complete the project was only ever going to be worth spending if the result was inaccessible to the average person. Gentrification has already wiped out much of the culture that gave New York City its identity, and to many people, Hudson Yards feels like insult after injury. It effectively privatizes the last sizable undeveloped chunk of Manhattan as the gulf between the uber-rich and the rest of us grows ever wider. It’s not lost on observers that the stairs of the Vessel lead nowhere. The work of climbing is supposed to be the reward, since there’s nothing at the top but a view of the Hudson Yards complex, or, if you turn inward, a view of all the other climbers still making their way up. The structure is just tall enough to pressure people who can climb stairs to do so; its lone elevator only stops at certain platforms, giving people with disabilities a limited experience of a limited experience. It’s only open in hours of daylight, and you have to book (free) tickets 14 days in advance to climb. In doing so, you must agree to a lengthy terms of service agreement stipulating that it’s your own fault if you die or get injured, and that any photos or videos you take and post to social media can be used to promote the attraction.